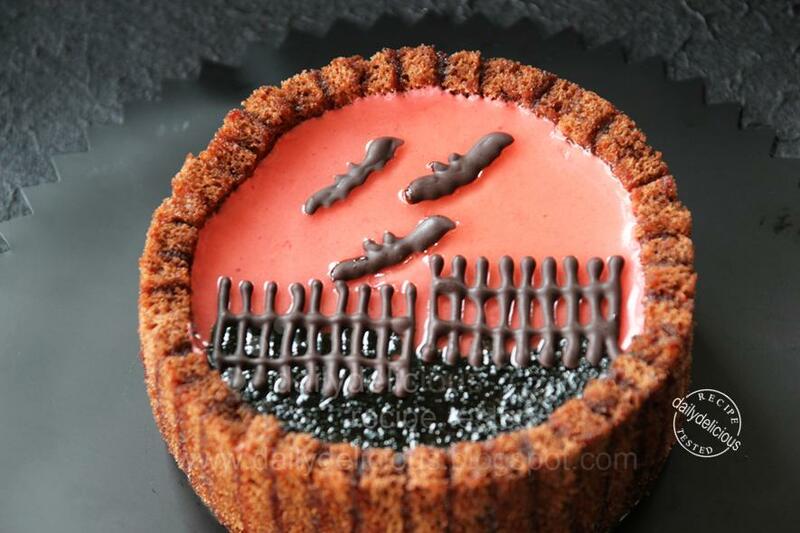 dailydelicious: Chicken Farm Baker's Project # 27 : Sweet Trick or Treat? Sweet H-A-L-L-O-W-E-E-N is coming! Chicken Farm Baker's Project # 27 : Sweet Trick or Treat? Sweet H-A-L-L-O-W-E-E-N is coming! The Halloween, well for me it's not so special, ^^", I never made anything for this occasion before, (haha, I have to tell you the truth, right?). Not that I don't like it, I just don't have anything to do with it. 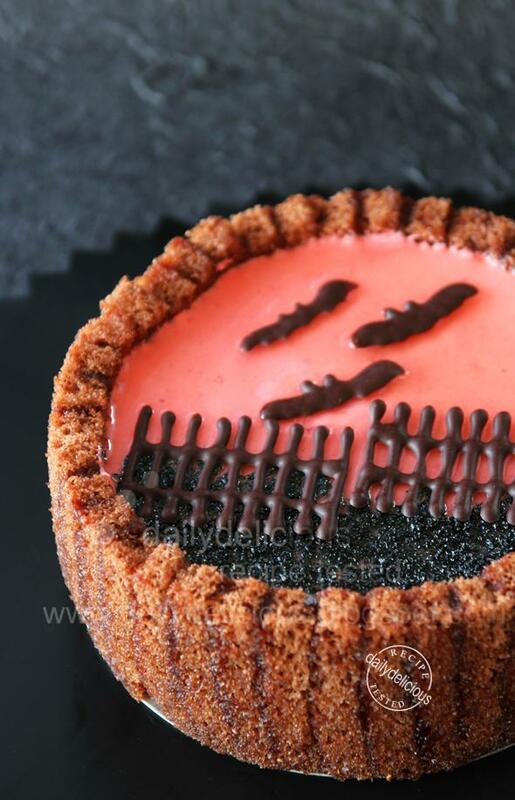 So when my friend, announce the project of this month "Chicken Farm Baker's Project # 27 : Sweet Trick or Treat? Sweet H-A-L-L-O-W-E-E-N is coming!". I had a feeling that I really couldn't think about anything >*<. 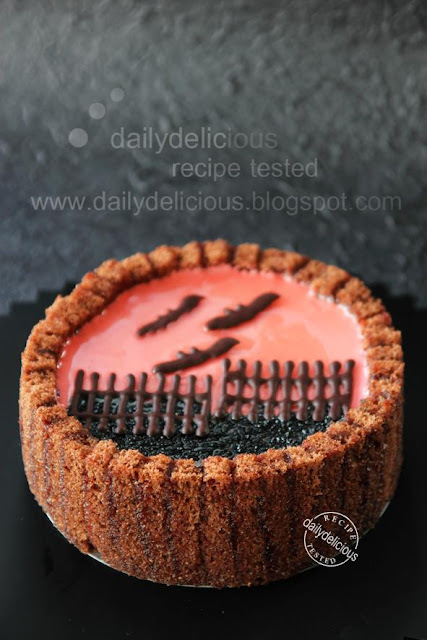 But after reading the rule I feel a bit relieve, because all that she wanted us to do is decorated any kind of sweet with the Halloween theme, or using the combination of color (like pink and black or yellow etc.). So, I start with the color, I choose to use pink and black, then I have to think about what I want to use for the pink part. I love the Raspberry mousse cake so it's a good chance to make it now. The last time that I make the cake I use the Joconde sponge, but because I want it to be black, I change the cake into chocolate sponge cake. 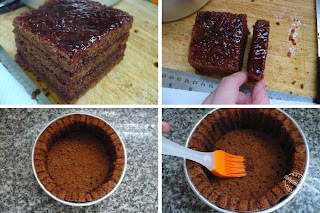 But the plain chocolate sponge will be boring ^^, and a bit too dry (for you sister's taste), I brush the sponge with a lot of syrup and spread the jam on it. They help to retain moisture and make the sponge more delicious. Now that I got the base, the decoration is easier, I make the bat and fence from tempered dark chocolate. 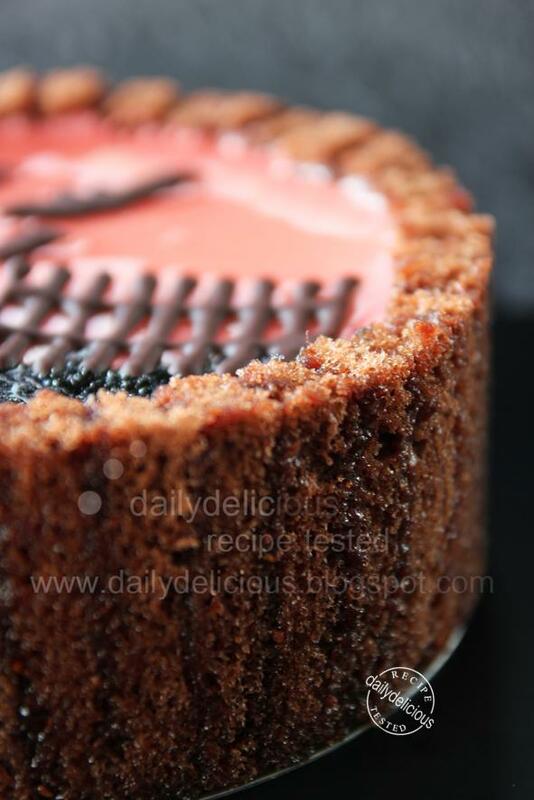 And make the black colored sugar by mixing the black color with the granulate sugar. Finally I got this cute little cake ^^, yes it's my first time for the fun of the Halloween theme, but I can say that it's not the last one because I start to think that "Halloween is a good time to bake something too". Preheat the oven to 200°C Line 24x34cm sheet pan with paper. 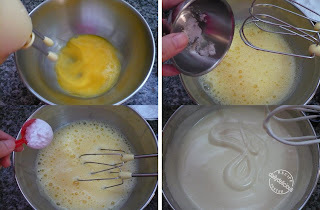 Beat the egg and salt until mix and lighter in color, gradually add the sugar into the egg and beat until ribbon stage (you can see that you can lift the beater and make the letter 8). Sift the cocoa powder, flour and corn flour together. Put the flour mixture into the egg mixture (divide the mixture into 3 parts) and fold gently until combine. Pour into the prepared pan and bake for 7 minutes. Put the water and sugar into small saucepan and bring to boil, until all the sugar dissolved, take off the heat and let the syrup cool. Mix the Crème de Framboises into 50g of the syrup. When the sponge cake cool completely cut into 2 -6 cm stripes (start with this and doing more if not enough), and 1 -12cm round. Brush the sponge with syrup, then spread the jam on the sponge, place another sponge on top, brush the sponge with syrup, then spread the jam. Cut the sponge in half to make four layers cake. Place the 12cm round sponge in the pan or cake ring, cut the layers cake into 1 cm piece and line the side of the pan with the layers cake. Sprinkle the syrup over the cake. The syrup is ready when it reaches 117°C; pour it over the egg whites and continue whisking until cold. Bloom the gelatin in cold water for 3-5 minutes. Put 50g of the puree into the microwavable glass or bowl, and heat for 30 seconds to 1 minute or until hot, put the gelatin in hot puree, stir to dissolve. Mix the hot puree with the rest of the puree and let it cool (if you want to add the food coloring adding it to the raspberry puree). Beat the whipping cream until soft peaks form. 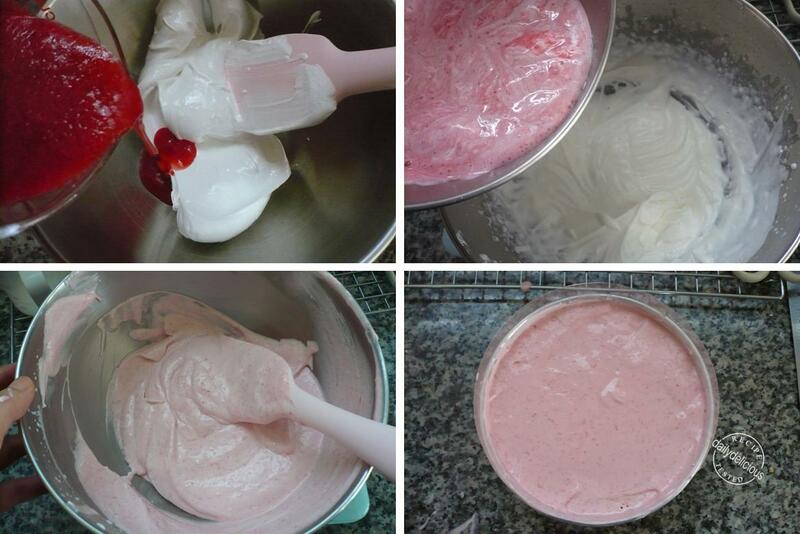 Mix the puree with the Italian meringue and fold to combine. 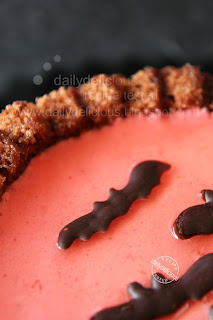 Pour the raspberry mixture into the whipped cream and fold to combine. 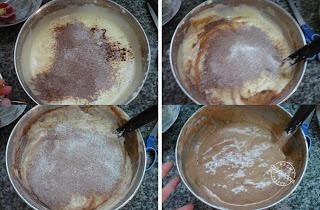 Pour the mousse into the pan. Smooth the top and refrigerate for 12 hours. Melt the glaze with the water, warm the glaze mixture and pour over the mousse, leave to set in the refrigerator for about an hour. For me, I use the tempered chocolate to make the bat and the fence, and make the black color sugar by mixing the granulate sugar with black food coloring. Sweet Trick or Treat? Sweet H-A-L-L-O-W-E-E-N is coming!